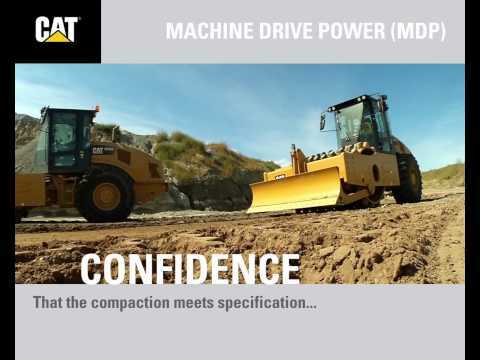 The CS66B is a 12-ton compactor designed for productivity and operator comfort. The newly designed console with intuitive LCD display helps operators leverage easy-to-use technology to reach target compaction quickly. Long service intervals and a no-maintenance hitch reduce operating costs and increase uptime. Optional equipment allows you to customize your CS66B to meet the specific needs of your application. – A padfoot shell kit provides versatility by allowing a smooth drum machine to compact semi cohesive and cohesive materials. – The kit comes with interchangeable smooth drum and padfoot scrapers. Oval pad design and square pad design are available. – Product Link system provides accurate, timely and useful information about the location, utilization and condition of your equipment. –The leveling blade features a new bolt-on design, A universal bumper design provides the capability.for the blade removal and reinstallation. Browse through these photos and videos for a closer look at the CS66B and what it can do for your operation. Wherever you want to go from here, the CS66B is ready. You can get in touch with us in a variety of ways. Check out our inventory of new, rental and used equipment. Connect with your local dealer, ask our experts for advice or read what's happening in the customer forums.